This portable speaker comes close to perfection, except in its lack of thump. If we cared only about features and ease of operation, the $50 Sbode M400 Bluetooth speaker would be a serious contender. 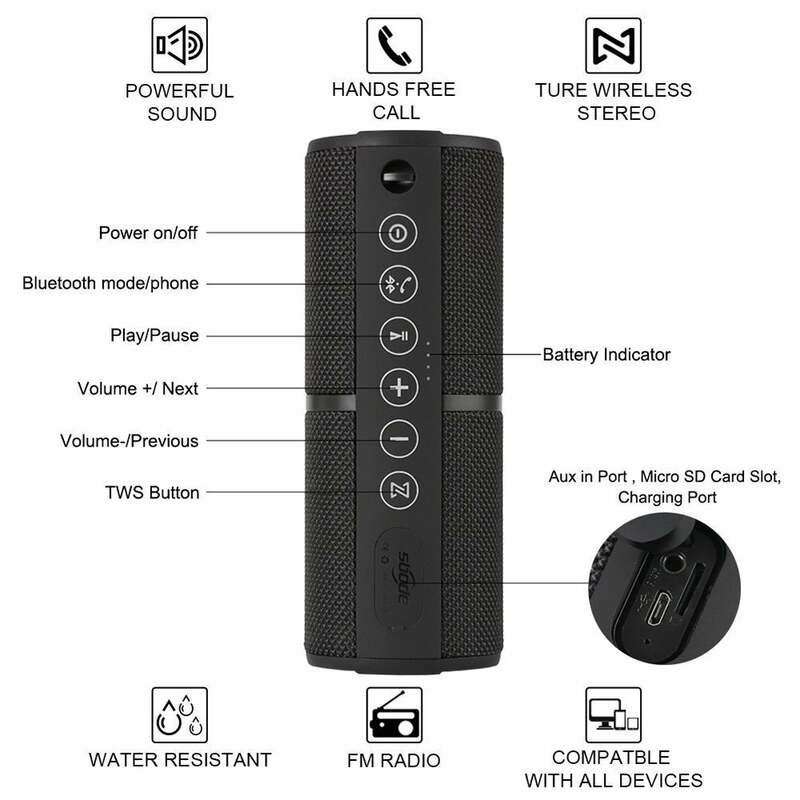 It's weather-resistant, it can play music stored on a microSD card, it can double as a speakerphone, it can be paired with a second M400 for true stereo reproduction; heck, it even has an old-fashioned FM radio onboard. About the only thing missing is the ability to charge other mobile devices via USB. But we care about audio quality much more than feature sets, and even at this price point, the M400 occupies a spot about halfway down our crowded leaderboard: Its fate determined in large measure by a major lack of thump. The M400 is a very handsome speaker. I prefer its industrial design to most of the similarly sized products from JBL and Sony that I've tested, and those are generally quite classy in appearance. Styled completely in black, with easy-to-read labels on its buttons, dark metal passive radiators on both top and bottom, and a decorative/functional wrist strap for toting, it just shouts beaucoup bucks. There's no way you'd peg it as a $50 speaker. The Sbode portable bluetooth speaker's feature set puts some of the name brands to shame. Pressing the power button will also cycle through the input sources: Bluetooth, FM radio, auxiliary input, and the microSD card (if one is inserted). I should mention that while the buttons are the membrane type, to keep water out, they offer a noticeable and satisfying click when pressed. That's not always the case even with much pricier speakers. The 3.5mm auxiliary input, micro-USB port, and microSD memory card slot are all hidden under a flap found directly below the buttons. 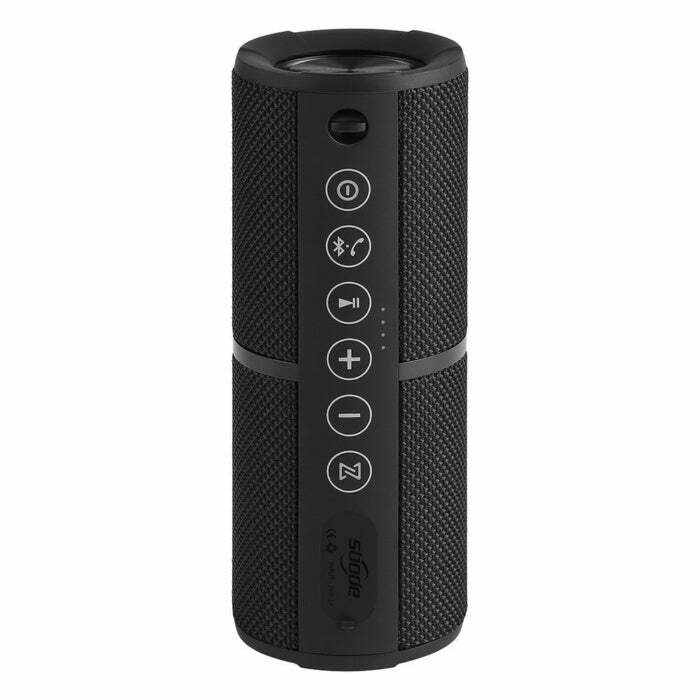 The Sbode M400 is the first Bluetooth speaker I've reviewed that will play music from a memory card. You can also load files directly from your computer if you turn the M400 off, where it snoozes in USB mass storage mode. I was also a bit surprised that the unit played more than just MP3s: WMA, standard 44.1kHz WAV, and even FLAC are supported. Apple users, however, will be disappointed by the absence of iTunes M4A support. I was absolutely not expecting a $50 Bluetooth speaker to talk to me, but the M400 provides a mellifluous female voice that tells you when you've switched input modes, are waiting to pair, are paired, are powering off, and so on. I'm not a huge fan of holding conversations with my appliances, but I actually enjoyed this little serenade. The M400 is quite light at around a single pound. Sbode sent me two units so I could test True Wireless Stereo (TWS) ,and it wouldn't bother me a whit to throw both in a backpack for any type of excursion (okay, maybe not hiking the Pacific Crest Trail). You don't need to worry about sprinklers or rain, either. Sbode has weatherproofed the M400 to IPX6, which means you can turn a hose on it, but not take it into the pool as you can with an IPX7-rated speaker. It might survive an accidental dip, but not full submersion. The best news about the Sbode is that it delivers a decent amount of volume with no discernible distortion. I found listening to it a mostly pleasant experience, though I was almost immediately pining for a bit of thump. I'm not a subwoofer fan in the least, so for me to miss bass means this speaker is definitely lacking low-end frequency response. Also, as with every weatherproof speaker I've ever tested, there's a modest, though not severe lack of brightness, aka high frequencies. Weather-resistant materials (at least those used in inexpensive Bluetooth speakers) and indirect wave radiation just aren't conducive to a top-notch sonic experience. The M400 is a very directional, so all the high-end you get emanates from directly opposite the vertical button strip. You basically need to point it directly at your ears, or only slightly off-axis, for the best experience. Sbode faces another challenge by virtue of its somewhat diminutive 2.62-inch diameter and 7.25 inch length. The less air there is to move, the harder it is to create bass. Yes, I'm back to that. But lest I overstate, you can definitely hear the kick drum and bass on the Sbode. There's simply a severe roll-off starting at around 100- to 150Hz, meaning that while you know they're present, you don't feel them as you should. 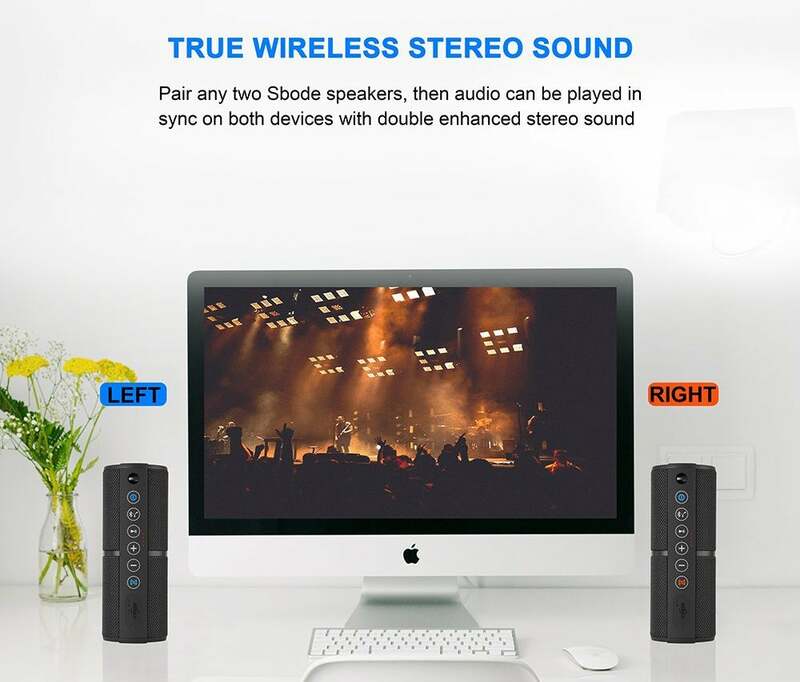 TWS in a $50 speaker? We're impressed. Other vendors should be so thoughtful. I found that placing the units (I tested two Sbodes in a pair for the most part) on a suitably resonant surface helped pump up the bass a bit, but the Sbode simply isn't dance-party worthy--despite the company's claims of enhanced bass. Once again, I'm comparing the Sbode portable BT speaker to units that cost another $20 at the very least, as well as perfection. Perfection being my pair of $700 Yamaha HS8 reference monitors. No, I'm not being fair, but the company set such a high standard with the appearance and feature set, I was simply expecting better sound. Had I known the price up front (I try to review without knowing such things) I probably wouldn't have been nearly as disappointed. Sbode claims around 8 hours of battery life, and playing at the low volumes I used, it managed a hair better than that. Standby time was a week and counting, with a good percentage of life left when I put them away. If the M400 hadn't fallen short on sonority, it would've easily ranked as the best Bluetooth speaker I've tested--easy to use, feature-filled, handsome, decent run time, and so on. As it stands, it's certainly the best $50 speaker I'm aware of. But the M400 is still a $50 speaker, and as a standalone, I can't get by the lack of thump when you can get it for only a bit more cash. As a $100 stereo pair, I'll give it the nod for quiet listening in a calm environment, such as a doctor's office. And I'd love to hear a similarly featured product from Sbode that isn't designed with weather and supreme portability in mind. They're certainly on the right track. If this $50 weatherized speaker's audio performance matched its comprehensive feature set, it would stomp the competition. But the M400 sounds only so-so, even when two are paired for stereo reproduction. We can't wait for them to send us something not limited by size and waterproof materials.